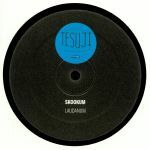 Review: Chicago producer M50, aka Area, and hypnotic techno don Donato Dozzy inaugurate new mysterious imprint Tesuji. On the A side Area tears it up on "Entireless," an industrial strength monster with grinding and razor sharp synth textures buzzing about the place in restrained fury and reminiscent of Regis or more recently Perc. On the flip Signor Dozzy serves up a surprisingly fierce yet restrained effort that's powered by all the atmosphere and tunnelling vision that he's renowned for. Sure he had to work some pretty intense source material, but he's no doubt made this one his own!